With Paul James, Anne Niepold and Gigi Biolcati, an extended weekend course for musicians to develop ensemble playing skills and make imaginative arrangements that are exciting to listen and dance to. We’ll be using music from European folk/traditional/popular music traditions as the raw material to make new arrangements that can go in any direction. The aim is to explore and combine all sorts of influences and ideas to make spine tingling music that is more than the sum of the parts. The course includes all day ensemble workshop sessions – and some short workshops on a range of topics in the early evening – with the aim of performing all the pieces we create together at a concert on the Sunday night. 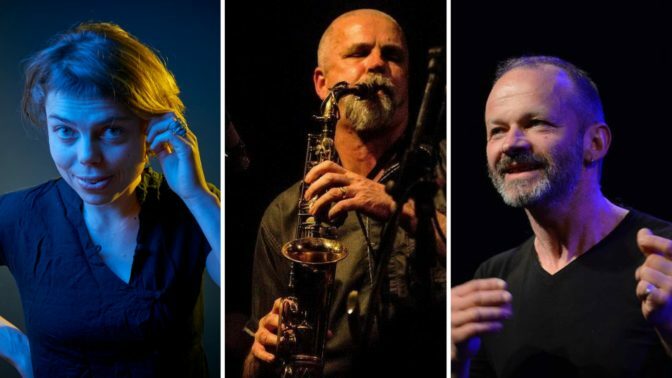 The course is led by composer/arranger Paul James – saxophones, border bagpipes (Blowzabella, Evening Star), Belgian diatonic accordion virtuoso and composer/arranger Anne Niepold and Italian drums/percussion maestro, composer and singer Gigi Biolcati (Riccardo Tesi / Banditaliana). Arrive in time for lunch (1pm) on Friday, and depart after lunch on Monday. If you play more than one instrument we advise you to bring it/them as this will help you to get the most from the course in terms of playing easily in different keys/modes, and also to be able to contribute in a way that is sympathetic to the style of the piece (bagpipes don’t sound great on everything!). During the course we will provide any music manuscript you need written out in Bflat/Eflat (for brass and saxes) as well as “concert”. To get the most from this course you don’t need to be the greatest musician but you do need to be able to play confidently and be positive, flexible minded and a team player prepared to try things outside your comfort zone – and have the energy for quite long intensive days of music making. Paul James is a saxophonist, bagpiper, singer and composer from Newbury who writes, arranges and performs music influenced by English and other European folk traditions. Paul was composer for the critically acclaimed production of John Milton’s ‘Comus – A Masque in Honour of Chastity’ at Shakespeare’s Globe Theatre in 2016. He has been a member of the hugely influential folk band Blowzabella since 1980, and plays with his pan-European band Evening Star. Paul composes and arranges music for theatre, film and TV and leads band/ensemble music workshops in the UK and across Europe. Gigi Biolcati – percussion, drums, body percussion – is from Santhià (Piedmont, Italy). He began playing drums at the age of 11, studied with Enrico Lucchini and played blues, funk, soul and pop music with Aida Cooper and Cristiano DeAndré. He then started a collaboration with dancer Koffi Kokò from Benin, and it was here that he found his personal approach to music. He went to Africa to study music and to search for the original roots of rhythm which has influenced all his playing ever since. Gigi plays with celebrated Italian accordionist Riccardo Tesi in Banditaliana, in pan-European band Evening Star (and other groups and European music projects with Paul) and with many other musicians in the world of European jazz and world music.